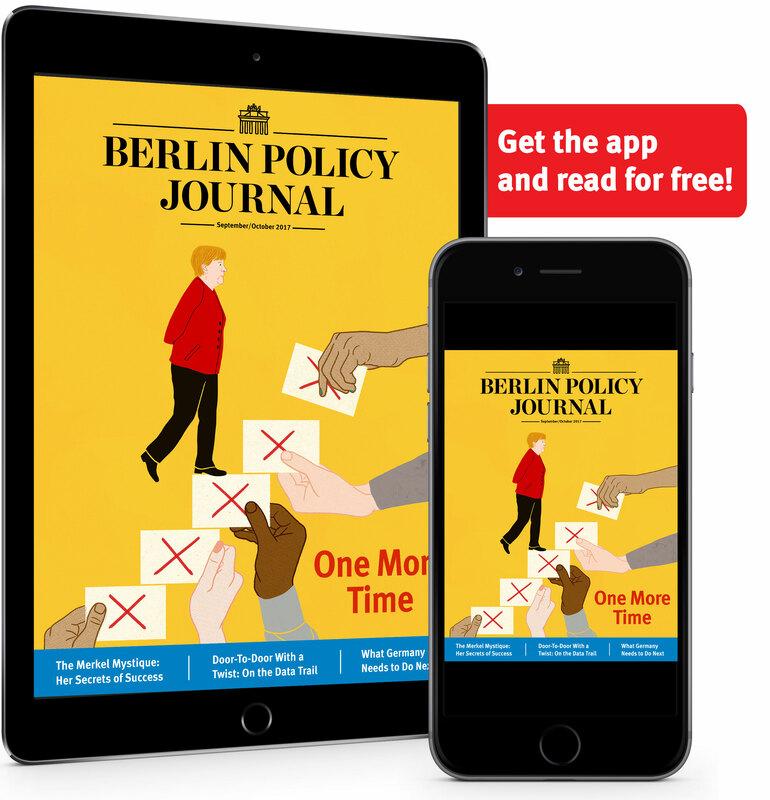 Reaffirming and extending the Élysée Treaty of 1963, Macron and Merkel missed a chance to demonstrate their common strength. It was a mixed day for both France and Germany. It was snowing in Paris. Montmartre was under five centimeters of snow. And the public interest in what was happening in Aachen quickly evaporated. The applause in the German border town came only from the selected guests. Outside of the Aachen town hall, the yellow vests protested, demanding the resignation of the French president and the German chancellor. There were also a few blue, pro-European balloons drifting in the damp winter air around the marketplace. But when Emmanuel Macron and Angela Merkel finally left the hermetically sealed ballroom of the town hall for the auditorium of the nearby high school, in order to carry out a so-called citizens’ dialogue with yet another group of selected French and German participants, they marched straight through the marketplace. They didn’t stop by the unselected participants, didn’t wave once, shook nobody’s hand, and didn’t hold hands. It seemed as if they didn’t dare, in public on the marketplace, to look to the right or the left. The chants of the yellow vests resounded behind them. It appeared that the president and chancellor were running away from them. Yet the leaders had all the time in the world. They had let exactly 56 years pass before adding this Aachen Treaty, a supplement, to the Élysée Treaty signed by their predecessors Charles de Gaulle and Konrad Adenauer on January 22,,1963. The Élysée Treaty once founded the Franco-German friendship. When it was signed, De Gaulle and Adenauer did not wade into the jubilant crowd either. But in the years since, everyone has agreed that the Élysée Treaty in particular contributed significantly to the reconciliation between French and Germans. So with the president and chancellor now showing up to renew the peace process of 1963, aren’t there enough reconciled French and Germans around to cheer their leaders on, or at least politely applaud? Evidently not. Apart from the yellow vests and the balloon-holders, there were hardly any people there. Not even curious bystanders were on the marketplace. The German public network ARD did show the signing live on TV—certainly by order of the political bosses. In France, though, the BFM network quickly went elsewhere. The snow in Paris was simply more important on this day. The president and chancellor seemed to feel that too as they made their businesslike crossing of the marketplace, without gestures or expression. Yet this could have been a moment of triumph—no, in fact, it had to be. 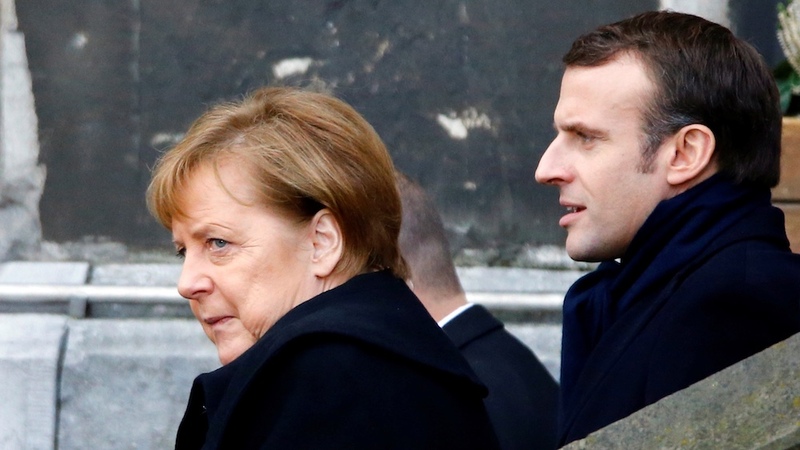 For the first time in history, France and Germany assured each other of mutual military aid in a crisis or a war, not as part of a union or larger alliance but as nations themselves. Article 4 of the Aachen treaty states that France and Germany will “provide aid and assistance by all means at their disposal, including armed forces, in case of aggression against their territory”. That means that even if NATO, about whose cohesion many have speculated since Donald Trump was elected US president, breaks up; even if the European Union, which is on its way to losing one of its most important member-states in the United Kingdom, keeps unraveling, it wouldn’t change a thing about this Franco-German commitment to help each other with “all means at their disposal”! For the Aachen Treaty now guarantees that. So France would risk nuclear war if it helped Germany. Previously the Germans had always imagined America playing this role in an emergency. Now the words of this treaty demonstrate a new, European security doctrine. Both countries’ goal is now to “strengthen Europe’s capability to act autonomously.” In plain English that means: in the future we want to carry out our own wars, if we really have to. It means that the president and chancellor would be, if necessary, the new supreme commanders of Europe. Still, where was the sign of power from the leaders in Aachen? Where did they show their new common strength? “Merkel and Macron sign without conviction,” ran the headline in the leading conservative French daily Le Figaro on the morning of January 22. Without conviction. That summed it up. This day lacked the gesture, the idea of action that would have showed the citizens of both countries: France and Germany are powerful and strong together! That would have showed: everyone has to beware of us, Russians, Chinese, the Americans, too, if it comes to it! We will defend ourselves! It didn’t have to be a military gesture. Perhaps simply throwing out an American and a Chinese spy, for example. The president and chancellor could have given the impression that they were serious, that actions would follow their words. But apparently we are not there yet. They preferred to argue about whether a jointly developed fighter plane, that won’t be ready to deploy for another ten years, may be exported to Saudi Arabia or not. Even though they don’t know which sheikh will be ruling then. The president and chancellor really should have demonstrated strength on this day, but they didn’t. “Strength is decisively important in politics”, Niccolo Machiavelli once said. One doesn’t have to be a Machiavellian to recognize that. Thomas Gomart, a director of IFRI, the French institute for international relations, cited the old Florentine in his book L’affolement du monde (The Panic of the World). Why, then, did the president and chancellor forego any demonstration of their strength? Didn’t they have anything to counter the world’s panic, its headlessness? No wonder that most commentators left and right of the Rhine quickly moved on to other things. The right-wing extremist Marine Le Pen spread rumors that the treaty included the German annexation of Alsace and Lorraine. Because there was so little interest, she was able to tell tall tales and get off scot-free. The president and chancellor, in any case, acted as if they had more important things to do at the moment. One section near the end of Macron’s speech was so heavily improvised that hardly anyone understood him. The president cited the vain Germaine de Stael, who liked to claim in her day, the 19thcentury, that she would use a German word as soon as she couldn’t think of a French one. In so doing he demonstrated his intellectual laziness. For every French who wants to show off his knowledge of Germany likes to cite de Stael, who was an early master of this sort of bravado. Unfortunately, Macron didn’t stop there. He explained that it was precisely the “untranslatable” that drew French and Germans together. It brought about romantic moments. People had to “cherish the irrational as a magical moment” of the Franco-German friendship. He had probably worked on this part of the speech until 4am the night before. (He supposedly always works so long.) And he clearly could have used more romance. Chancellor Angela Merkel was not much better. She emphasized again and again that this was mostly about work and duty; she is not always so tritely German. 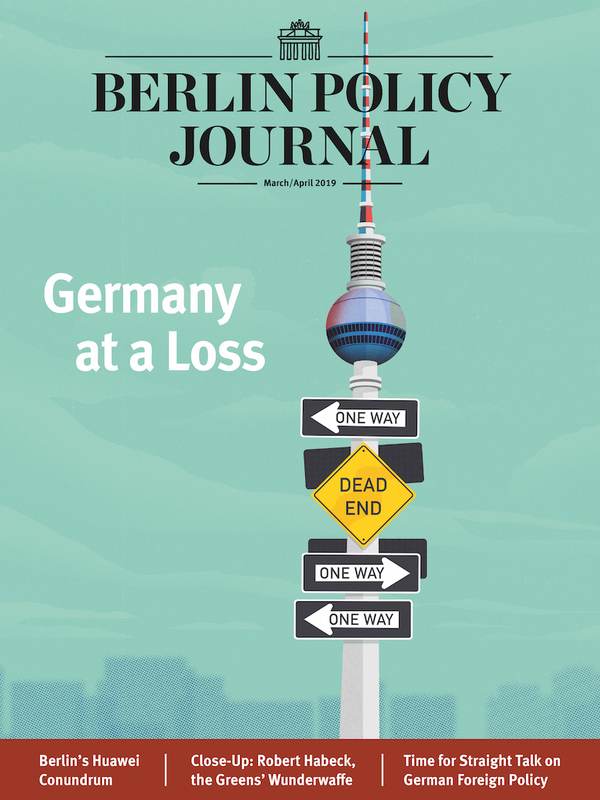 What counts, the chancellor said in Aachen, is the “decisive will to actually fill the treaty with life.” That was supposed to mean: people, the work really begins now. But she didn’t say what she would do to make that all happen. Rather, she added, “Yes, we have this unconditional will. I commit myself to it.” As if any French had ever doubted the conscientiousness of the German chancellor. This far and no further—that was the lasting impression of Aachen. As if in the future, despite all the nice commitments on both sides, things could only go backwards. Anyone who does such a poor job of selling Franco-German unity as Macron and Merkel did on this day doesn’t really believe it in themselves.